This week’s topic is parenting. While almost all of us have grown up with some sort of parental figure, every one of us had a different experience. Not only were our environments different from one another, but we were also guided by different parenting styles. Any of us who are or plan to become parents will differ in how we guide, teach, and reprimand our children. These differences are the cause of many debates. A perfect example of this is the whole “should I spank my child” debate. While there are numerous differing opinions, research studies, blogs, and educational resources devoted to these topics (note that such examples can be found here , here, and here), the reason this debate even exists in the first place is because of the varying nature of how parents choose to raise their kids. Authoritative: This type of parenting is defined as having high expectations (high demand) for children paired with a high level of responsiveness and support towards their child’s needs. As a result, parents often have an open and communicative relationship with their child that is low in judgement. However, note that even though parents listen to their children and discuss expectations with reasoning, parents in this category often set firm limits based on sound explanations. This relationship is nurturing and raises children who are friendly, self-reliant, and cooperative. Many children raised with this type of parent are achievement-oriented, autonomous, and socially-competent. This category is recognized as the most effective and beneficial parenting style for children with normal growth, development, and behavior. 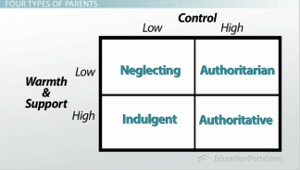 Permissive: This parenting style is high in responsiveness but low in strictness, control, and expectations. This style is often characterized as passive. As a result, these parents are viewed as “indulgent” because they are lenient with their children by having lax rules and boundaries, as well as a nurturing and loving relationship. Parents show their love to their children by giving into the child’s wants and often do not want to disappoint or discipline their child. As a result, these parents have few rules or structure, occasionally as a means to avoid conflict with the child. These parents often play a passive role and act as a resource for their child, rather than actively guide them. Children with this type of parent often struggle with self-discipline and self-control. They may also feel insecure, have under developed social skills, and be self-centered, causing them to struggle with authority figures and have difficulty forming relationships with their peers. Authoritarian: This parenting style is high in expectations and low in warmth/responsiveness.This parenting style is highly controlling and strict discipline. As opposed to authoritative parents, these parents are less likely to engage in discussion with their children about rules and standards, and they often believe that children should accept and follow rules without questioning. This strict parenting style also often relies on punishment. Children raised by parents using this style can either become rebellious(and even aggressive) or they remain submissive and dependent on their parents. This is because, although rules and structure can make children feel secure, rules without discussion can cause low self-esteem, fearfulness/shyness, and difficulty in social situations. Uninvolved: This parenting style is also called “Neglectful.” These parents are low in control and low in warmth, leading to unresponsive, unavailable and even rejecting parents. They place few demands on their child and often minimize interactions with their child. This parenting style is characterized by a general disinterest in their child’s needs and whereabouts. Occasionally, these parents have other priorities that they place higher than their child and do not make time to interact with them, or they may feel overwhelmed with parenting. Additionally, parents that adopt this style may be self-centered individuals who do not recognize their child’s needs, or they may have “given-up” on trying to be a parental figure. Children with these parents have difficulty trusting others and forming relationships. These children may also develop low self-esteem, low self-confidence, and issues with self-regulation. Additionally, a child may chose another role-model for behavior, which can lead to them picking someone who does not set a good example. Overall, this parenting style is deemed the most damaging to growing children. If you are interested in determining your parenting style, a quiz from the Univeristy of Minnesota-Extension can be found here.The style names differ from the ones outlined in this post, but correspond to the same descriptions (ie: Authoritarian=Demanding, Positive=Authoritative, Unengaged= Uninvolved). A child needs a warm, supportive environment that has reasonable expectations and open communication. These things can be met through a variety of parenting methods. Parents can often gain skills and improve their parenting methods through education, support, and practice. In fact, the University of North Texas notes that there are more than 50,000 parent education programs and more than 100 media based parenting publication resources available to parents and families. Programs like Just in Time Parenting offer educational newsletters for each developmental stage from the first trimester to 5 years of age. It provides education on child development, solving common problems, and how to raise a happy, healthy child. Additionally, the Child Welfare Information Gateway has multiple resources for parent education programs, including those focused on specific topics or situations. It is even beneficial to look for resources in your own town. For example, my family’s school district even has classes aimed towards parents and grandparents of students. A quick google search brings up a long list of opportunities to learn and become involved in my local metroplex. While many people feel that parenting should be second nature and develop seamlessly as parents raise their children, this is not always the case. Sometimes social support makes parenting easier, and sometimes parents are bombarded with conflicting information, as I mentioning in the opening of today’s post. Always know that there are resources out there designed to help you be the best parent you can be. Don’t be afraid to reach out!